Summertime is welcoming us and we’ve got to prepare to embrace it with love and excitement. Your wardrobe also needs some additional color and print, don’t you feel? 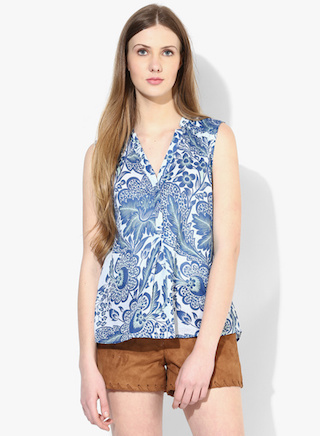 So here are some gorgeous printed tops that you can flaunt this season! Pair them up with skirts, pants, or shorts - you’re going to look like a butterfly! 1. The Red & White Medley! 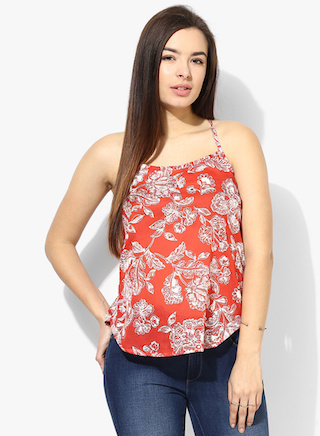 This cross back floral-printed top is so easy-breezy, we have to get our hands on it. It’ll look amazing with denims or linen pants, and a hint of silver to our accessories will do the trick! Wear it with a lace shrug when you’re going out! Price: Rs 599. Buy it here. 2. The Blue Pottery Style! This one is an absolute favorite. Long enough to be worn with low-waisted pants or boyfriend jeans. And to add that hint of fancy, team this up with some silver kicks and some funky sunglasses. We’re cool for the summer! Price: Rs 600. Buy it here. Who wouldn’t want to show some love for birds? Some happy owls are all we need to feel cheerful and make the day jumpier! 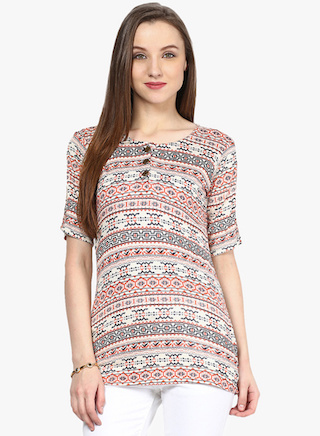 Those bright-colored bird motifs can be paired with denim shorts or skirt and some gladiators to end with finesse. Price: Rs 499. Buy it here. 4. The One In Love! 5. The Fair Isle Stripes! 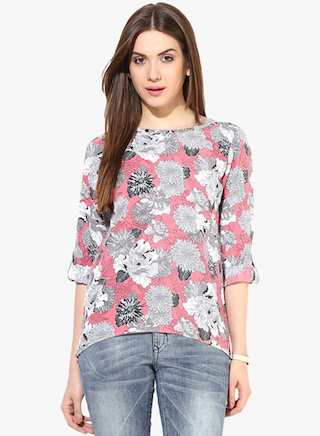 On days you don’t want to experiment too much and just throw on a comfy but pretty top, this is your choice. Keep the overall look neat by pairing this with white sneakers and acid-washed denims. Don’t forget to carry your backpack and a cap. 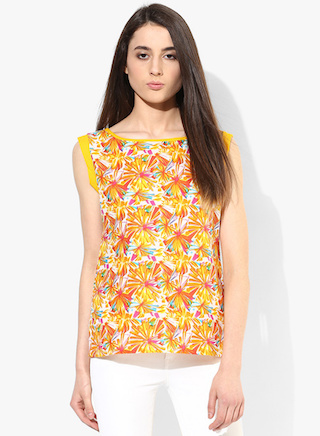 For every girl who likes to look bright and loves orange, we recommend this adorable top. With the interesting details on the bodice and added gathers on the waist, this seems like a great option for days you want to stand out from the crowd! Price: Rs 425. Buy it here. This is so different from what you’ve got in your collection already, isn’t it? Non-fussy, simple, yet with a splash of color - this can be teamed with your loose linen pants, or palazzos, on days you want to feel relaxed! Price: Rs 500. Buy it here. We are in love with this special one, right here. 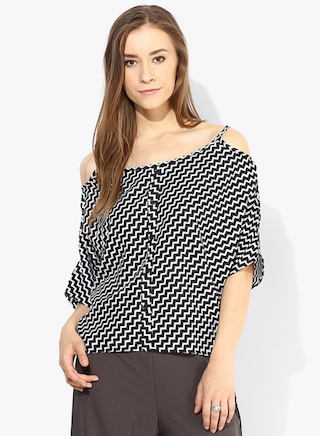 Cold shoulders are back in fashion and what better way to flaunt it than in this slant chevron! Can be worn to parties or to college, since it can be styled in so many different ways! Wear them with shorts on your trip to the beaches soon! Price: Rs 599. Buy it here. WOW! Those colors! The amazing shade of yellow and the hint of other colors makes this one a delightful top. For that price, we’d love to get a couple of these! Wear this with white pants, jeans or a skater skirt! You’ll glow either way! Price: Rs 419. Buy it here. 11. The Bias Bright Bonanza! The bias-cut wonder with those striped patterns is all that we’re looking for to make our wardrobe unique! The fun combination of colors got our eyes gleaming and we’d love to wear this with long tasseled earrings and some hand accessories. Price: Rs 412. Buy it here. 12 .The Cutesy Bow One! This one gets us going…” Awww!” The colors of those dainty flowers and that adorable bow in this girly top are what our hearts want! 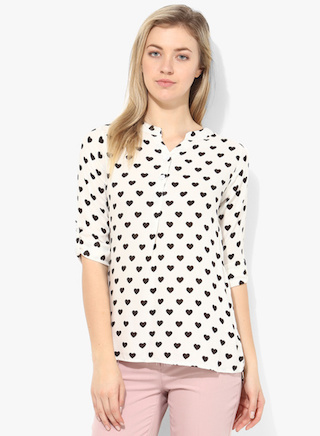 Wear this with white shorts to match, or with pastel shades of pants and some block heels, and you’re all set! Price: Rs 499. Buy it here. MUST-READ: 9 Indian Brands That Fulfil ALL Your Western Wear Needs! MUST-READ: WHAT?! Amazing Party Tops For Less Than Rs 500? Oh YES!